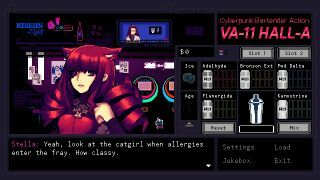 VA-11 HALL-A describes itself as a 'cyberpunk action bartending' game, and while I'm not sure about the 'action' part, it's definitely a cyberpunk bartending game. Customers come by, tell you what's on their minds, and order drinks which you must mix. You can mix the drink you want or mix something else, and that acts, in a sense, as your dialog option. The conversation will go different ways depending on what you serve, and hopefully you'll also make enough money for rent each month. I had a chat with Michael Kelly, who's composing the music, about how quality bartending can move along the story.